DYKES ARE BREACHED IN THE MEKONG DELTA The Mekong Delta is poised on the brink of a revolution. In order to cope with salinization and climate change, dykes are going to have to be broken down and farming and freshwater fisheries replaced by shrimp farming. COLOPHON Wageningen World is the quarterly magazine for associates and alumni of Wageningen University & Research and members of KLV, the Wageningen Alumni Network. A digital version of the magazine can be found at www.wur.eu/wageningen-world Publisher Wageningen University & Research, Marc Lamers Editorial Board Ben Geerlings, Ike de Haan, Bert Jansen, Jac Niessen, Irene Salverda, Antoinette Thijssen, Judith van Veen, Delia de Vreeze Magazine editor Miranda Bettonville Copy editor Rik Nijland Alumni news Anja Janssen Translators Clare McGregor, Clare Wilkinson Art direction and design Petra Siebelink (Wageningen University & Research, Communication Services) Cover picture Shutterstock Overall design Hemels Publishers Printer Tuijtel Hardinxveld-Giessendam ISSN 2212-9928 Address Wageningen Campus, Droevendaalsesteeg 4, 6708 PB Wageningen, PO Box 409, 6700 HB, Wageningen, telephone +31 317 48 40 20, wageningen.world@wur.nl Change of address alumni alumni@wur.nl Change of address associates wageningen.world@wur.nl, mentioning code on adress label Change of career details alumni@wur.nl The mission of Wageningen University and Research is ‘To explore the potential of nature to improve the quality of life’. Under the banner Wageningen University & Research, Wageningen University and the specialised research institutes of the Wageningen Research Foundation have joined forces in contributing to finding solutions to important questions in the domain of healthy food and living environment. With its roughly 30 branches, 5,000 employees and 10,000 students, Wageningen University & Research is one of the leading organisations in its domain. The unique Wageningen approach lies in its integrated approach to issues and the collaboration between different disciplines. UPDATE News in brief about research and developments at Wageningen University & Research. DUTCH BANANAS! The first Dutch bananas were harvested to great acclaim in a Wageningen greenhouse last December. Not from the soil but from rockwool and coconut fibre. ‘WE WANT TO MAKE A DIFFERENCE’ Wageningen will be collaborating even more with partners. That is one of the main themes of the strategic plan for the next four years. CRICKETS IN THE PORRIDGE Several hundred people have started rearing crickets in Kenya and Uganda. This new phenomenon in Africa is providing the local population with additional protein and income. TESTING SHELLFISH WITHOUT LAB ANIMALS A method developed by the Wageningen institute RIKILT for identifying toxins in shellfish has prevented the use of hundreds of thousands of lab animals in recent years. PERSONALIA Information about the lives and fortunes of Wageningen alumni. KLV Announcements from KLV Wageningen Alumni Network. Professors Marten Scheffer and Willem de Vos were appointed distinguished professors at Wageningen University in December. They are the first to be awarded this new honorary title. Queen Máxima and President Halimah Yacob of Singapore visited WUR’s Horticultural Centre in Bleiswijk on 22 November, as part of Yacob's state visit to the Netherlands. Yacob, her husband and Queen Máxima looked at innovations in a tulip greenhouse, a tropical greenhouse and a tomato greenhouse. Due to climate change, large areas of Europe are getting a lot less snow. The thickness of the snowfalls has been going down by 12 per cent per decade, shows an analysis by a Wageningen student. Wageningen is organizing the first competition for growing cucumbers from a distance: the International Autonomous Greenhouse Challenge. The question was whether artificial intelligence (AI) with sensors and cameras can take over the control of climate and irrigation in greenhouses from the growers. Dutch cows eat mainly grass and maize, but a new crop, sorghum, is gaining ground. Wageningen is studying the potential of this tropical crop. Sorghum is a cereal species from Africa which is also grown on a large scale for livestock feed in the US, among other places. There is growing interest in the Netherlands as well. Sorghum is higher in protein than maize and is better for the soil, says researcher Gerrit Kasper of Wageningen Livestock Research. The plant puts down much deeper roots than maize, and this has a positive influence on soil structure. More carbon is stored in the soil in the roots that are left behind, too. Cooler beach can protect sea turtles from extinction Simple measures could significantly improve the declining reproduction rate among sea turtles due to climate change, suggests a study in the St Eustatius Marine Park. technology for measuring the cow’s emissions in the barn 24/7. ‘Farmers still don’t know much about the climate problem. It’s yet another thing for them to have to think about, on top of manure, ammonia, stink and fine particles,’ says Groenestein. Even more book-keeping, even more regulations. So the research coordinator has allocated some money to communication about the research results. ‘Technically, a great deal is possible. A lot depends on what aspects of the climate solutions farmers can put into practice – apart from the measures for conventional issues such as ammonia emissions. As well as whether they can make a good living, and whether consumers are prepared to pay for it.’ The exhalation of methane causes a substantial part of climate gas emissions from livestock. Pieter Vink of the Boerenhart cooperative proudly receives the first bunch of Dutch bananas from Professor Gert Kema. to disease, but also for other reasons, such as flavour. The ultimate goal is to make global banana cultivation more sustainable.’ REGIONAL PRODUCT Meanwhile, the question is whether there is any commercial mileage in the Dutch banana. The first harvest was marketed by Boerenhart, a cooperative that supplies regional products from the province of Gelderland to companies, hospitals and catering outlets. The Wageningen banana project fits the cooperative’s vision on sustainability and corporate social responsibility, as Pieter Vink of Boerenhart told the media. Kema and Vink are exploring the potential for a semicommercial trial in the Netherlands. Harold Meijer: ‘You might think in terms of a niche market for banana varieties that taste delicious but are not yet for sale here. the women to get hold of the money themselves. Because rearing crickets is a relatively new phenomenon, men are not getting involved much at all. They don’t see any business potential in it.’ COLD NIGHTS Meanwhile, in Kenya, over 400 people have taken courses run by trainers taught by Dutch experts. And about 100 of them have gone into business. In Uganda too, about 100 small businesses have started up, also along the shores of Lake Victoria. ‘The crickets there are growing much slower than expected, however, probably because the nights are just a bit too cold there,’ says Beckers. The crickets are kept in crates, which must be wellventilated, but hermetically sealed because there are so many predators at large: snakes, mice, rats, spiders and lizards are all crazy about crickets. Dutch companies such as Kreca EntoFood, Venik and NGN have a lot of experience of rearing insects. They produced the first cricket crates, which are now being copied locally. No one knows exactly what African crickets eat in the wild, but a successful feed has been developed in the project. If the farmers have a bit of land, they can grow their own green fodder such as maize and leafy vegetables. Two kilos of cricket feed produces about a kilo of crickets, says Becker. ‘That is a much higher conversion factor than you usually get in livestock farming. For beef you can easily need five to seven kilos of plant protein to produce one kilo of animal protein.’ THIRTY CRATES The crickets turned out to grow slower in Africa than they did in controlled indoor conditions in the Netherlands. So farmers need to rear a lot of crickets if they are to establish a commercially viable business. Beckers: ‘We have therefore developed a rearing set of 30 crates. You can get about 1500 crickets into one crate. Ten crates are used for the eggs from which the next generation of parent crickets is hatched, and the other 20 crates of crickets are harvested. When the last crate is empty, the first new one is ready for harvesting.’ The mature insects are blanched in hot water. Sometimes they are eaten whole as a deep-fried snack. The crickets are fed on vegetables and specially developed cricket feed. GMO REGULATION European legislation does not see conventionally mutated crops as an environmental risk. Because the technique has been in use since 1930, there is a lot of knowledge about its safety. Techniques such as CRISPRCas do not have that kind of track record yet, and therefore come under the strict GMO regulation. The DNA of a tomato has one billion DNA letters. If you compare a modern tomato with a wild ancestor, 20 million DNA letters differ. Those differences came about through breeding and using radiation or chemical treatments: mutagenesis techniques. CRISPR-Cas is a new technology for creating genetic variety. This precise gene-editing technology is used to cut through a DNA letter at a particular location. The technology is developing very fast. There are now variants that not only cut through the DNA, but also change DNA letters, from a C to a T, for example. This makes the outcome more predictable. indica rice in order to get the plant to develop shorter stalks, a property associated with improved yields. Yieldimproving mutations have also been made in soybeans. And an American laboratory has mutated a gene in tomatoes so that the plant’s growth is more compact and it flowers (and consequently bears fruit) earlier in the season. Furthermore, mushrooms have been developed with CRISPR-Cas that have less of a tendency to turn brown thanks to mutations in an enzyme. It also turns out to be possible to modify the composition of fatty acids in oilbearing crops. After 1975, Vietnam became the worldâ&#x20AC;&#x2122;s second biggest exporter of rice. Shrimp farming grew up a few decades later, in response to salinization. aquaculture, mostly farming tilapia. Thanks to this development, which WUR researcher Roel Bosma assisted with, Vietnam has grown into a significant exporter of shrimps and tilapia. Bosma helped develop the Good Shrimp Farming game, and he too is present at its trial run in Can Tho. ENVIRONMENTAL LIMITS There is every reason to play this game, says Nhan, as the agricultural sector in Vietnam faces another transition. Intensive export agriculture is coming up against environmental limits such as pollution with pesticides, and falling biodiversity and soil fertility. It has got to give way to a more environmentally friendly way of farming that keeps an eye on food quality and consumer demand while addressing the issue of climate change. 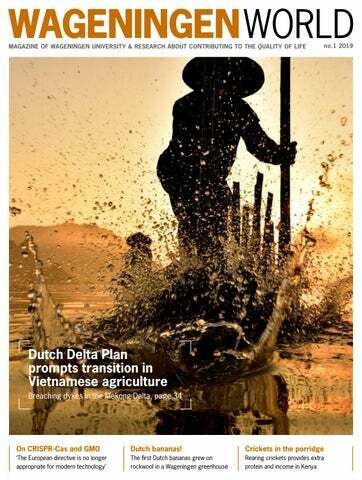 The blueprint for this transition is outlined in the Mekong Delta Plan, drawn up at the end of 2013 by a Dutch consortium of WUR, Deltares and consultancy firm RoyalHaskoning DHV. One of the main authors in this consortium, which was led by ex-minister Cees Veerman, was WUR researcher Gerardo van Halsema. is a map on the table, with farm plots on it. A player throws the dice, lands on a particular plot and then has to deal with the situation described on that plot. The shrimp farmer learns about farming options, ecological constraints and market developments. This opens up several perspectives on ways of improving your local environment. You might want to produce more fish, for example, but you could also combine aquaculture with vegetable growing and with tourism.’ Ha thinks this game has something to offer rice and tilapia farmers, too, by shedding light on their business strategy. RAKING Around Can Tho, at the heart of the delta, thousands of canals connect the three main estuaries of the Mekong. Travelling through the area, you still see countless rice fields, in which the farmers are raking the wet soil after the last harvest, or ploughing it using a tractor or a buffalo. It is difficult to imagine that this region faces water shortages and even salinization in the spring. But that salinization is already coming close to Can Tho, which is 60 kilometres away from the sea. Sustainable shrimp farming in a mangrove forest that protects the coast. Loes Moor-Hulshof on the production line for vegetarian hamburgers. ers who supply AAA members has gone up by 35 per cent,’ says Karama. IMPACT ON FARMERS ‘Large sums have been invested in the AAA project, but if you look at the impact it’s already had on farmers, that is certainly justified,’ says Bram Huijsman, former director of Wageningen International at WUR. He came up with the idea of the business club in 2010, and has been involved in the AAA since then, together with former Wageningen Ambassador Piet Heemskerk. ‘We wanted to stimulate entrepreneurship in Africa in the supply chain between the farmer and the market. The SMEs form a crucial link in that chain,’ states Huijsman. ‘We thought beforehand: this is such a good idea, it is bound to take off. But that’s not how things work. Building up a member organization is a long-term process. You can’t go faster than the local momentum. The entrepreneurs have to build it up themselves. We coach, but they’ve got to do it. So they largely dictate the pace.’ Jan Kat could see that the AAA programme was ‘outside Wageningen’s comfort zone’. ‘But the commitment of the researchers was tremendous. They contributed to laying foundations that the organization can now go on building on.’ The development of AAA has gained momentum now. As of 2019, the AAA has 260 paid-up members. Karama’s ambition is to grow to 500 members in 2020. Initially in the current six countries, but Ghana, Zambia and Nigeria have shown an interest as well. AAA recently started offering funding for loans of between 2000 and 20,000 dollars as well, without requiring any security. The money for this comes from a number of philanthropic partners who contributed to the Food for Thought project too. Another sign that the AAA has reached maturity is its growing influence. The organization is recognized by the government of the six East African countries as a representative of SMEs in the agri-food sector. Karama: ‘We join the conversation about agribusiness policy, entrepreneurship and trade issues. Many people and organizations follow us and appreciate what we do. Our visibility is growing.’ W Network activities run by the Africa Agribusiness Academy in East Africa. Twenty years on, alumnus Calum Revfem from New Zealand still feels a bond with Wageningen. He helped set up an alumni network in his country. ‘I find it valuable to be part of that’. Over 300 people attended the World Lecture on Wageningen Campus at the end of November. The subject – combating climate change (mitigation) versus adaptation – is a hot topic among alumni and students. Alumnus Jan Lindenbergh has donated an unusual book of prints by Maria Sibylla Merian to the Wageningen university library. On 5 February 2019, he came along to hand the book to Executive Board President Louise Fresco. Environmental Sciences student Niu Shu posted a question on WUR Connect about what kind of job she could apply for when she graduates. She received a prompt reply from senior recruitment consultant Dotty Aalmans at Toyota Motor Europe. Niu can think in terms of jobs in waste or environmental technology in the car industry. Event 1 April: Hannover Messe, Germany. Alumni are welcome at the Holland High Tech pavilion from 15:15 to 17:30. Members Who is on WUR Connect? Most of the members are alumni (82%) and the rest are students (12%) or in the category ‘other users’ (6%). The main suppliers of alumni are the Nutrition and Health degree programmes. Photos You can see and upload photos on WUR Connect too. You’ll find photos of the alumni meeting in New Zealand, for instance. Upgrade The WUR Connect platform is due for an upgrade, which will open up more ways for alumni to get in touch with each other. 1984, Wageningen Ambassador, has been appointed member of the supervisory board of the Rabobank for a period of four years. Aris teaches at INSEAD Business School. 12 December 2018. WUR Biology 1983, has been appointed extraordinary professor until 30 September 2021 at the School of Economic Sciences, North-West University in South Africa. Hofstede will be working at the Centre for Applied Risk Management on agent-based modelling of socio-technical systems, especially ‘artificial sociality’, as he did in Wageningen. 1 October 2018. Protection 1997, has been sworn in as mayor of Bladel. He was previously working at the ministry of Infrastructure and Water Management. 16 January 2019. 1995, has been appointed member of the supervisory board of Rabobank MeppelStaphorst-Steenwijkerland. Brandsma is co-owner of the Batenburg dairy farm in Giethoorn. October 2018. Health 2009, has won the 2018 NAV publication prize for her article ‘Effect and maintenance of the SLIMMER diabetes prevention lifestyle intervention in Dutch primary healthcare: a randomized controlled trial’. 1 November 2018. Rian van Dam MSc, WUR Domestic Science 1986, has been inaugurated as mayor of Hollands Kroon. She used to be programme director of Greenport NoordHolland Noord. 12 February 2019. Prof. Ruud Huirne, WUR Agrarian Economics 1986, has resigned as director of Netherlands Food & Agri at the Rabobank and is now working part-time as a special consultant on Food & Agri for the Rabobank. He and a number of partners are also setting up a company in sustainable energy and green raw materials. 1 January 2019. Life Sciences, Master’s student, has won one of the 13 Unilever Research Prizes worth 2500 euros. 27 November 2018.
has been appointed professor of Microbiology. Ettema has spent the past 12 years working at Uppsala University in Sweden. 1 January 2019. Bioprocess Technology 1999, has been appointed member of the executive board of the pension administrator APG Group. She has previously been managing director of Xenos. 1 November 2018. Karin Horsman PhD, WUR Plant Breeding 1991, has started as director of Strategy and Academic Affairs at Leiden University. Horsman was previously manager of National Accounts and assistant director of Corporate Strategy & Accounts at WUR. 1 January 2019. Ruben Smit PhD, WUR Forestry 1996, received the Golden Film award from the Netherlands Film Festival and the Film Fund for his nature documentary Wad about surviving on the boundary between land and water. The award is given when a film attracts 100,000 paying visitors. The director and ecologist Smit, whose company is based on Wageningen Campus, had already received this award for his documentary The New Wilderness. Smit is mainly pleased that he and his team was able to make the film about the Wadden Sea’s nature. ‘There is so much going on with the nature in the Netherlands, partly because of climate change. The Wadden Sea is the most fragile nature area our country has. I hope the film will help improve conservation of this area.’ The Golden Film award and associated plaque were handed over on 20 December 2018 in the Heerenstraattheater cinema in Wageningen. and malaria expert (Radboud University) received the prize of 35,000 euros for the way he inspires businesspeople, researchers and students in the field of sustainability. 10 December 2018. 1988, is the new director of Bosgroep Midden Nederland, a cooperative of forest and countryside landowners. 1 March 2019. WUR Domestic and Consumer Studies 1989, has been inaugurated as professor of Health, Behaviour and Society at Tilburg University. Schuit was head of the Centre for Nutrition, Prevention and Health Services at the National Institute for Public Health and the Environment (RIVM) and held the chair in Health Promotion and Policy at VU University Amsterdam. 30 November 2018.
ogy 1971, emeritus professor at WUR, has been honoured with the International Leadership Award. He received the award for his â&#x20AC;&#x2DC;huge contribution to food security and rural developmentâ&#x20AC;&#x2122;. 25 October 2018. Sascha van Rooijen MSc, WUR Economics of Agriculture and the Environment 1995, has started as the director of the Netherlands Wind Energy Association (NWEA). November 2018. 1984, has been appointed professor of Veterinary Immunology and Infectious Diseases at the University of Edinburgh. 1 August 2018.
ogy 1994, has become vice-president for APAC (Asia-Pacific) at IMCD, a supplier of specialist chemicals and food additives. 1 December 2018. Prof. Peter Twumasi WUR Biotechnology 2003, has been appointed director-general of the National Sports Authority (NSA) of Ghana. Twumasi is head of the department of Biochemistry & Biotechnology at the Kwame Nkrumah University of Science and Technology (KNUST) in Ghana. 6 December 2018. Prof. K.J. Beek, WUR Tropical Rural Economics 1962. Former chair of WUF. 13 January 2019. Mr G.H. de Bruijn PhD, WU Tropical Plant Breeding 1964. Mr W. van Donselaar MSc, WUR Farming Technology 1977. 20 September 2018. Mr H.J. Doude van Troostwijk MSc, WUR Rural Economics 1959. 22 November 2018. Emeritus Prof. W.J. Feenstra, WUR Horticulture 1954. 2 November 2018. Mr C. Geerling PhD, WUR Forestry 1970. 24 November 2018. Mr P.A.M. Jansen MSc, WUR Forestry 1957. 20 November 2018. Ms W.A. Jongbloed MSc, WUR Horticulture 1959. 8 October 2018. Mr P.P. Koks MSc, WUR Agricultural Plant Breeding 1956.18 November 2018. Mr G. Londo, former member of staff at WUR. 18 December 2018. Mr G.J. Mocking MSc, WUR Food Technology 1975. 7 November 2018. Mr F.G. van Ogtrop MSc, WUR Forestry 1989. 9 November 2018. Mr S.F. Postma MSc, WUR Rural Sociology of the Non-Western Regions 1964. Mr A.C.M. Schimmel MSc, WUR Land Development A 1987. 21 December 2018. Mr S. Schukking MSc, WUR Dairy Production 1957. 6 January 2019. Ms N.J. Schukking-Vos MSc, WUR Horticulture 1957. 26 April 2018. Mr J. Smelt MSc, WUR Biology 1983. 25 May 2018. Mr P. Tilma MSc, WUR Agricultural Plant Breeding 1957. 5 September 2018. Emeritus Prof. A.J.W.G. Visser, 28 October 2018. IN MEMORIAM (CONTD) Mr B.W.L. Vlaanderen MSc, WUR Landscape Architecture 1990. 29 November 2018. Mr C.A. de Vries MSc, WUR Tropical Rural Economics 1967. 24 October 2018. Prof. H.W. de Vries, former director at WUR. 8 February 2019. Mr C.J.M. Wijnen MSc, WUR Rural Economics 1967. 30 April 2018. Prof. W.J. Wolff, former part-time professor in Aquatic Ecology. 27 November 2018. Mr G. Zijlstra MSc, WUR Land Development 1953. 6 December 2018. Mr J.J. Zuidberg MSc, WUR Forestry 1958. 17 July 2018. 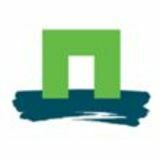 If you would like to inform us of the death of a fellow former student or relative, you can email alumni@wur.nl or send a death announcement to the Alumni Department, University Fund Wageningen, Droevendaalsesteeg 4, 6708 PB Wageningen, Netherlands. Paul Mentink MSc, WUR Biology 1983, draws on nearly 50 years of bird-watching in the book Mijn vogels, belevenissen van een vogelaar (‘My birds, experiences of a birdwatcher’). There are chapters on his behavioural studies of the house sparrow and his work for the protection of the barn owl. The hardback (32.85 euros, 132 pages) is illustrated with pen and ink drawings by Harm Echten and is published by Brave New Books. KLV is for everyone at Wageningen. It aims to foster contacts with other KLV members, alumni, students and the university. You can network in your own subject area through the study groups and sub-networks. KLV also offers career support services such as a CV check and relevant workshops. Members often get discounts too on admission charges for lectures and debates. Come along to one of our events and get to know us! A selection is shown here – go to www.klv.nl for a complete overview. KLV Wageningen Alumni Network is Wageningen University & Research’s active, thriving alumni society with around 7000 members.